Doug Ford displays his knowledge of legislating when he was asked "Could you explain to the people of Ontario how a bill becomes law, step by step?" The url below includes video of the question and answer. "You know something my friend, we can run through that," Ford said. "And I know this is a gotcha question and everything because that's your game, big smile on your face. "But don't worry, I'm going to show you how many bills we're going to pass. We're going to pass endless bills down there and I hope you're down there to watch the bills get passed." This is not the first time Ford has had a tense exchange with a journalist since winning the PC leadership in March. In an interview with CBC 's "Ottawa Morning" radio show that month, Ford clashed several times with host Robyn Bresnahan when she pressed for specifics on his plan for the province. NDP picking up more support! Strategic voting only works for the NDP when it doesn't work for the Liberals. It's also "sauce for the goose". The case against "strategic voting" is that you prefer the values of the party you support even when it's not "strategic" to vote for them. Since the Liberals as a party have no values, no ideas they would rather lose an election than abandon, no consistent record of staying in any one part of the political spectrum(in provincial and federal elections alike, they've run as a party of the right as often as they've run as a party of the "center-left"), there is no case for continuing to vote Liberal when doing so reduces-as it does this year-the chances of stopping an extreme right-wing government. You don't have to choose between heart and head in this one...you don't have to choose between the practical and the idealistic...in Ontario, in this election, voting ONDP is a vote for BOTH. Here's the live broadcast of the Northern Ontario debate already in progress. Meagan Fitzpatrick: Closing statements now. So basically this debate was the 3 leaders trying to prove who loves northern Ontario the most. Most notable was Ford going on the attack against Horwath for the first time. The last tweet by Fitzpatrick shows the Cons know that both that the NDP are strong in the North and that five of the last six poles show them ahead of the Liberals, causing Ford to redirect his fire toward Horwath. It appears now there is only one way to stop the PCs and that plays right up the alley of the Liberals's favourite political game - strategic voting. If enough former Liberal supporters vote for the NDP, Horwath might just able to hold the PCs to a minority government situation, and then the NDP could form government with the support of the Liberals. If Jerry Dias would just give up on the "strategic voting" thing(especially since there's no "strategy" anywhere in Ontario now in which voting Liberal is the only way to beat the PC's) and throw his support to the party most of the Ontario labour movement backs, this race would be all over. The Northlander was a passenger train service that used to run between Toronto and Cochrane. The service was cancelled in 2012 as part of an effort by Queen’s Park to rationalize the cost of running the railway. The service had been subsidized by the Ontario Northlander Transportation Commission (ONTC), an agency of the Ontario government. Do we have political leaders or sheep herders? He's in the middle of a political campaign. If that's not the time to "play politics", when is? We are looking at a repeat of the 2011 Federal Election where the Conservatives won a majority, with the NDP becoming the official opposition. Horwath won't be able to peel off Ford supporters, because studies have shown once a populist gains a supporter, they won't change their mind. Ever. Which is why Ontario's been ruled by Mike Harris for the last 23 years. Even if that bizarre statement were true, Horwath doesn't need to peel off Ford voters. She can win if Ontario Liberals truly wish to stop Ford at all costs. Polls are moderately encouraging on that so far. “A Ford misstep right now would largely benefit Horwath,” he says. Some 80 per cent of Ontario voters tell pollsters they want change in this election. Ford can position himself as the change candidate, but then again so can Horwath. An Ipsos poll showed that voters are much more open to the NDP as a second choice than to the other two parties: 30 per cent say they would support the NDP as a second choice, as opposed to 15 per cent for the Liberals and 13 per cent for the PCs. Horwath might benefit from voters hostile to Ford settling on the NDP, if the Liberals look like they’re facing a crushing defeat. Almost three-quarters of Ontarians agree that the economy is rigged to advantage the rich and powerful. • Almost two-thirds of Ontarians say it is hard for them to get ahead. • Sixty-eight per cent express frustration with not being cared about by traditional political parties. • Two-thirds think the mainstream media care more about making money than telling the truth. And — here's the punch to the gut — "To combat these feelings, Ontarians want a strong leader who can take the country back from the rich and powerful (81%) and a leader who is willing to break the rules (53%), says the report, prepared for Global News. Unfortunately Ontario voters see Ford as that leader to express their anger, instead of Horwath. Too Close to Call projection based on the polling. By that logic, the 20% of 2014 OLP supporters who say they are part of "Ford Nation" (a statement that doesn't even equate to an actual plan to vote PC) can't ever be won back, which means, if being a member of "Ford Nation" equates to planning to vote PC, it's equally the fault of the OLP that Ford has a lead. It doesn't mean the ONDP is in league with Doug Ford. It doesn't mean that ONDP supporters are responsible for the the current, diminishing PC lead in the polls. It doesn't morally disqualify the ONDP from trying to win the election, which they still have a real chance to do. It doesn't mean that it's a betrayal of the fight against demagoguery for the ONDP to have gained votes from the OLP. It's better for former OLP supporters(given that we've established that the OLP could never have been re-elected this year)to support a MORE progressive party. As to 2011, Harper would have won a majority even if the NDP vote hadn't risen at all. It wasn't the NDP's fault that Michael Ignatieff was a total disaster as Liberal leader, and there's nothing the NDP could have done that year that could possibly have made it harder for Harper to take a majority. And you damn well know it. Too close to call...is that the Grenier guy? I could go either way on these results. At first look, it's decent - I think the NDP seat ceiling is about 33 in this province and the Conservative total is about right but then you look at the actual seat by seat stuff and those results look like computer modelling based on polling and not real on-the-ground analysis. The NDP shutting the PC and Libs out of the north? No NDP seat losses to the Conservatives? No one voting Liberal in Essex and only 2 percent in Timmins? For the Liberals, you have to choose between the vote percentage and the seats. There are 15 ~ 20 solid safe Liberal seats in this province, rock bottom base numbers. 24% would get them more than 14 seats. And some of the best NDP hopes are in ridings where the Conservatives are either incumbents or are their main competitior. The Liberals could, conceivably, end up with more seats than the NDP despite garnering a lower share of the vote. Ken Burch still in denial about Union and Blue Collar voters abandoning the NDP for Ford populist message. The same polls that have him peeling blue collar support also have him losing former PC voters. In both cases, the NDP is the primary giver but also taker, and the Liberals are not immune by any means. Let's be honest, Ford isn't going to win this election by only winning NDP seats. The issue with Ford is does he gain more voters than he loses? I'd say that he gains more than he loses. By a lot. But to suggest it's a one-way flow between only two parties is just partisan pandering. Let's try discussion, not messaging. The biggest barrier for the NDP to get into minority or majority government territory are the GTA burbs: notably, Mississauga, Halton, York Region and Durham (except Oshawa). Can they put any of these areas into play? The most recent polls, which show the NDP surging and the PC's stationary prove that isn't happening anymore. There simply isn't any case you can make, based on the polls, that show that either the NDP gains in the polls helps Ford OR that the Liberals have a better chance of stopping Ford than the NDP. And as you've been repeatedly reminded, the one poll you keep citing which, which simply showed a percentage of "2014" ONDP voters saying they identify with "Ford Nation"(which doesn't equate to an actual intention to vote PC, btw) ALSO showed a larger precentage of 2014 OLP voters making the same identification. Why do you keep acting like the figure on 2014 ONDP voters in that one poll matters and the figure on 2014 OLP voters doesn't? ​The ONDP is not collapsing, it's gaining strength. It would not make it easier to stop Ford if the ONDP vote share was lower, because that would only mean more voters staying away from the polls. It wouldn't mean more votes for the OLP and the OLP is no longer, in any sense, more electable than the ONDP. Your talking point is discredited. Union and blue collar voters simply AREN'T abandoning the ONDP. If they were, it would be mathematically impossible for the ONDP's support to be rising in the polls. During the 2016 U.S. election campaign, American newspapers and television networks found Donald Trump so ghoulishly fascinating they devoted many hours and many pages of coverage to him. Reporters, hosts, editors and producers for news organizations such as CNN may have believed their obsessive and never-ending coverage of Trump served the purpose of exposing a lying charlatan and bully for what he is. The news organizations’ management had a less enlightened motive. They knew the Trump story would help boost ratings and readership. As it turns out, all that media attention did not serve to expose and thus fatally wound Trump. Quite the contrary, it provided oxygen to his campaign. Up to this point, we have been seeing a repeat of that same syndrome in coverage of the Ontario campaign. 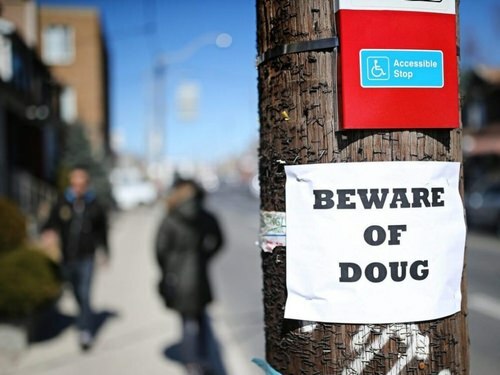 A large number of Ontario election news stories focus primarily on the antics of Doug Ford, the Progressive Conservative (PC) leader. The other leaders do get covered, but, all too often, only in so far as they react to Ford. The CBC carried a Canadian Press (CP) story on the debate, which framed the event solely as part of a determined Conservative effort to grab northern seats away from the NDP. The CP/CBC story’s focus was completely about how Ford is turning his attention away from Liberal premier Kathleen Wynne to the NDP’s Andrea Horwath, whose party is rising in the polls. As with the Toronto Star story, other leaders are worthy of attention only in terms of their reaction to Ford. The first four paragraphs of the CP/CBC story deal exclusively with Ford’s attacks on Horwath and the NDP. It seems the Conservative war room found what they believe to be dirt on one NDP candidate. He is, as the Conservatives put it, an anti-mining environmental extremist. Ford made an effort, during the debate, to pummel Horwath with that so-called revelation. The CP/CBC story on the debate reports virtually the entirety of Ford’s tirade on that subject -- which was, mind you, a tiny part of the whole debate. When the CP/CBC story finally turns its attention to Horwath, it notes that she parried Ford’s thrust by mocking him for not even releasing his own program. The CP/CBC story completely ignores virtually everything substantive the leaders had to say in the debate. The story’s subhead is: “Health care, resource development and transit were front of mind for voters.”But that is the only mention it makes of those issues or what the leaders had to say about them. The most memorable moment, as the CP/CBC story sees it, came after the debate was over. That was when Ford repeated the gratuitous comment he had made during the first debate about Kathleen Wynne’s smile. That’s it. That’s the story the public broadcaster provided to those interested in the campaign. It was all Ford, all the time. Indeed, CBC apparently thought Ford’s smile comment was of such great interest that it ran a second story focused exclusively on that tiny incident, and various folks’ reaction to it. And that’s how cheap-trick political artists like Trump and Ford win the battle for public attention. They play on our fascination with the aberrant, the bizarre and the offensive. Conservative strategists obviously believe any attention their leader gets is good. In fact, they would rather the media focus on such epiphenomena as the smile comment than on substantive policies. They have precious few of those. The denizens of the PC war room also know that Ford would almost certainly have great difficulty defending or even clearly enunciating the few policies his party does have. Better to have facile reportage on campaign trivia than serious discussion of issues such as health, education or Indigenous rights -- as long as it is Ford-related trivia. Of all the media coverage of the northern debate only National Post columnist Chris Selley got it right. His headline read: “Ford the huckster replaces calm, measured version in second leaders’ debate”. The campaign is still young and Horwath’s apparent rise in public esteem could provide the media with a new story line. Ever preoccupied with the horse race, some journalists are now examining the hypothesis of Ford winning a plurality, but not a majority on June 7. Maija Kappler has a story for CPon just such a hypothesis. She asks both Wynne and Horwath what they would do in that situation, and both, rightly, demur. Badgering candidates with this sort of hypothetical question only has the not-very-helpful effect of sowing doubt on any legitimate and democratic outcome other than one party winning more than half the seats. To make matters worse, CP and Kappler get their facts wrong at the outset when they refer to the possibility of Ford winning a “minority”. A party that wins the largest number of seats, but short of 50 per cent plus one, does not, automatically, win a minority -- that is, the right to form a minority government. That party would only gain the capacity to form a minority government after winning a confidence vote in the legislature. In the most recent British Columbia election, Christy Clark’s Liberals won the largest number of seats, but not a more than half. Shortly after the election, they tested their capacity to carry on in the legislature, but lost the vote of confidence. The lieutenant governor then called upon the second-place party, John Horgan’s NDP, to form a minority government. The same happened in Ontario in 1985. That may all be a matter of semantics, and a bit abstruse even for many reporters and editors. What is not a semantic question is the fact that once the voters elect 124 members to the legislature, then, and only then, will the parties and elected members have the responsibility to decide what kind of government they want. 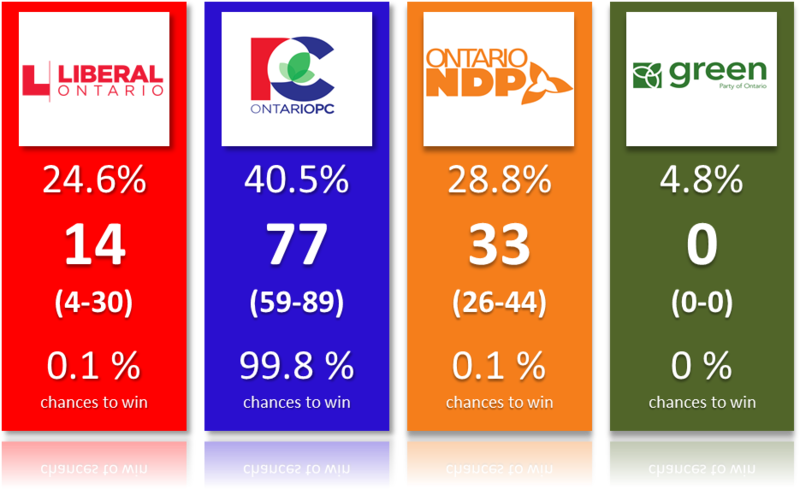 If no Ontario party wins a majority of seats on June 7 we could have a coalition government. That would mean parties would share power -- and seats at the cabinet table. Or we could have a minority government, in which one party governs with enough legislative support to get it over 50 per cent on key votes. Coalitions are extremely rare in Canada. Minority governments are not. Usually it is the party with the greatest number of seats that gets to form a minority government, but not always. It is not the case, currently, in British Columbia and was not the case in 1985 in Ontario. For now, it would be more helpful if media coverage focused on the kind of leadership and the sort of policies the parties and their leaders offer. Once the voters have made their collective choice there will be plenty of time to figure out what shape a new government might take. I guess there's something to the adage that any publicity is good publicity. Especially in a multicandiate race. Pre-election, or post-election? It shouldn't be ruled out if no party wins a majority. You just continue to be in denial about former NDP voters going to Ford. Because you continually discounting Red Tories and Blue Liberals going to the NDP, thus boosting their numbers, at the expense of the Liberals. For every NDP supporter they lose, they probably pick up twice as many Red Tories and Blue Liberals. Not only them, but certain pollsters who keep releasing inflated numbers for Ford and the NDP so they bury the Liberals once and for all.